What are the main factors that can contradict with your application performance? 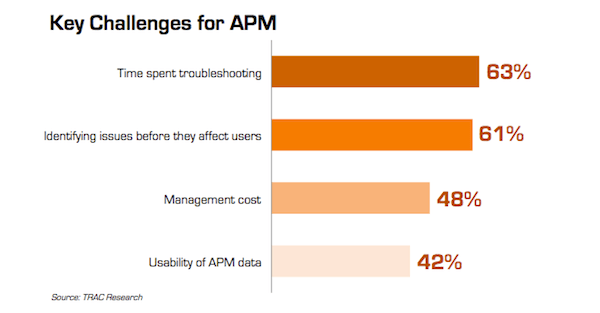 What drives you to find solution with Application Performance Management (APM)? This 5 top factors list will cover the impacts of the application, to the surrounding and the network, to the people behind those applications. All of these factors should be considered when managing application performance to tackle the issue quickly. Application complexity is one of the biggest factors impacting application performance. Today’s services and applications, specifically those conveyed via the Web, are a montage of components that come from various places such as data center, cloud, and third-party. Multiple moving parts must be execute in the manner to provide a great experience for end-user, while the customer or employee looking at a browser window sees a single application. Maybe the app server and Web server are doing fine, but user experience will suffer if the database is staggering. Being able to measure and keep tabs on all those moving parts is the test and requires an APM tool that can provide a view into the performance of all the parts, not just individual components. Performance goals need to be characterized when applications are specified, in parallel with the information of the environment the applications will run in. A number of times improvement is left out and applications are monitored, analyzed and being repair after released into production. This never works as well as when performance is one of the key goals of the application design before a line of code is written. In addition, the factor too affects application performance today which poorly optimized code and infrastructure, such as sub-optimal SQL queries and poorly configured network infrastructure. All of these problems can be hard to cater, and the emphasis on DevOps processes can cause multiply quickly by increasing the rate of change in the data center. Hence, it is important to capably tool the data center to monitor and report on all aspects of a deployed application using code level instrumentation, EURT and network performance tools, and traditional IT infrastructure monitoring solutions. Nowadays, applications are generally developed in simulation labs with no performance test on live networks. Before applications are displayed, transport in highly distributed network architectures today should be monitored and optimized. Fault testing of the application in the live production environment impacts performance. Tied to that is for developers and testers to have a clear understanding of the non-functional performance criteria. The network on which the application is used impacts performance greatly, in particular for mobile and cloud. Inconsistent bandwidth, high jitters increased latency and packet loss all work to decrease application performance. While it might not be able to cloud networks or control mobile, by building and apps test with these network conditions in mind the issue can be comprehend. Before the network impacts are felt by users, this will gives organizations the opportunity to optimize app performance . How the application will be used? How many people will continuously use it and for what kind? This will affect application performance as well as give corresponding application architecture and its scaling assumptions that go into its design and deployment. This lack of understanding actual user transactions and performance itself can stir the performance during the critical peak usage period. Applications should be able to cater during peak usage to deliver better user experience. It should be able to downshift to preserve resources when demand is low. To make this thing work, , at a minimum APM technology should provide a governor or feedback loop to the app regarding end user experience and internal app/infra operations. 1. 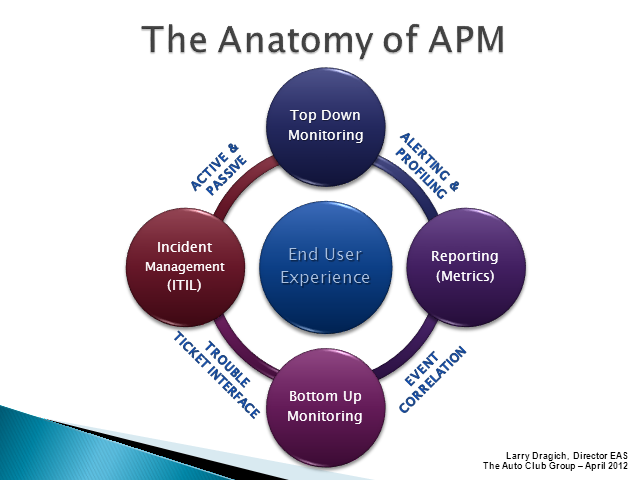 Does Application Performance Management (APM) Critical To Network Health? Contrasting capabilities is a vital part of evaluation when we appraise application performance monitoring (APM) solutions. However it can create deceives. There are many features that provide by application performance monitoring solutions which is not a crucial part for the user. Frequently the solutions are expensive, complex, and hard to implement in what we want. Though sometimes there are not high priority in which the features included in the affordable products. The most important thing is how nearly each solutions can fits your needs rather than determine by cost and features of a product. For reducing user complaints as a top priority, you’d need the first four of the above capabilities plus end user monitoring to alert and report on user experience’s effect of web application performance. This exercise gives a better position to find a solution of documenting your prioritized goals and mapping them to product capabilities to prevent dissapointment.